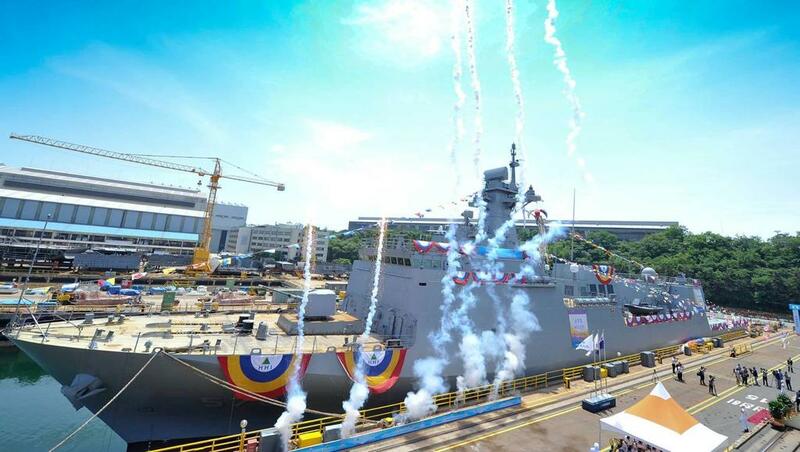 SEOUL, — Hyundai Heavy Industries (HHI), the world's largest shipbuilder, has launched MLS-II Nampo, its second minelayer for the Korean Navy. The launching ceremony at HHI's Ulsan, South Korea, was attended by Mr. Baek Seung-joo, Vice Minister of National Defense of Republic of Korea; Mr. Kwon Oh-gap, President & CEO of HHI; and 100 other guests. The MLS-II Nampo is both HHI and Korea's second minelayer and follows MLS-560 Wonsan, delivered in 1997. The next-generation stealth minelaye can carry 120 crew and measures 114 m in length, 17 m in width and 28 m in depth with a displacement of 3,000 tons. It is specially built to lay a large number of mines precisely at the designated spots in a short period of time. The MLS-II Nampo is scheduled to be delivered to the Korean Navy by October 2016 after outfitting work, sea trials and final inspections. HHI has delivered a total of 71 naval ships to the Korean Navy, including 12 frigates/patrol ships, three destroyers, three submarines, and two Aegis destroyers. The Republic of Korean Navy MLS II Nampo Minelayer vessel.